Many birds die before their time as a result of mistakes made by their owners, either unintentionally or through ignorance. Learn about the top ten reasons birds die, and just perhaps, this information may save some birds' lives. Deprivation of water can also have fatal results. The most common reason for this happening is due to a water bottle malfunctioning. If the delivery tube's ball sticks, or if a bird stuffs an object into the tube, effectively blocking it, a bird will be deprived of water. If an owner doesn't check that all water bottles are working every day, or if it is not noticed that the water level in the bottle is not going down, it may be days before an owner recognizes a problem. Rarely, the unthinkable happens and a bird's water bowl may go unfilled for days, or the bird may empty the bowl, which goes unnoticed, resulting in fatal dehydration. Most birds will die if water is withheld for three days, unless lots of moisture-laden foods are fed. I recently treated a peach-faced lovebird that was severely dehydrated due to a malfunctioning water bottle. The owner had changed the water two days previously, and hadn't noticed a problem until she saw her lovebird wobbling on the perch, eyes closed. She rushed him to my practice, when she had discovered that the water bottle wasn't working, and with treatment and good support care, he survived. I have also dealt with several aviaries that used a water delivery system, and one or a series of waterers malfunctioned or were turned off, resulting in the death of birds. Water, whether in a bottle or bowl, should be checked daily. If a bird is to be allowed freedom outside of its cage, its wings should be properly clipped. This means that it can glide gracefully to the ground. If the wings are not clipped correctly, or if several primary wing feathers have grown back unbeknownst to the owner, an alarmed bird may end up flying erratically around the house, or worse, launching itself to the top of a tree! Some avian vets actually have a name for birds that have had run-ins with ceiling fans (shredded tweet!) If a bird is frightened, it may mistake a window or mirror for open spaces, and end up with a concussion. Contrary to popular belief, birds RARELY break their necks with such an injury. In all my years of practice, I have only seen two birds with compression fractures in neck vertebrae as a result of flying into an object. They can, and do, however, develop concussions, bleeding inside the brain, fractures, lacerations, ruptured air sacs and other serious, potentially deadly injuries, however. I can't tell you the number of times that a client has told me that their bird, although flighted, never flies, yet they are calling to inform me that it has just flown away! The perils outdoors are too numerous to list. Birds indoors have flown into pots of boiling water, open commodes, windows, mirrors, fondue pots and an active fireplace, to name just a few of the household hazards that I have seen. Non-stick cookware and other household items possessing a non-stick surface made from polytetrafluoroethylene (PTFE) can be toxic to birds. If overheated (temperatures over 530 degrees F), the gas released is extremely dangerous to birds and can result in death. However, even with normal usage, some fumes may also be released, so non-stick cookware, drip pans, irons, ironing board covers and heat-lamps with a PTFE coating should not be used around birds. Passive inhalation of cigarette, cigar and pipe smoke can cause chronic eye problems, skin irritation and respiratory disease. Birds that live in homes with smokes may develop coughing, sneezing, sinusitis and conjunctivitis, which may resolve spontaneously, if the bird is moved to a location free of smoke. Some birds exposed to chronic second-hand smoke will develop secondary bacterial infections, as well, which can prove fatal. Many common disinfectants and household cleaning agents release fumes that can be toxic or fatal to birds. Chlorine bleach, phenols and ammonia can all have dangerous vapors that can cause irritation, toxicosis and even death. Common household aerosol products, such as perfume, deodorant and hairspray, can cause respiratory problems in birds. They may cause severe inflammation and difficulty breathing, and after large or direct exposure, death can occur. Any pump spray or aerosol using a propellant can be dangerous to birds, and these should not be used around birds. Natural gas leaks can cause sudden death in birds. Any type of heater, used improperly or with inadequate ventilation can be deadly to birds. Carbon monoxide, an odorless, colorless and tasteless gas, can also be fatal to birds. Anyone with pet birds should have a working carbon monoxide monitoring device in the home, preferably in the room where the birds are kept. Second-hand smoke from marijuana can also cause severe depression and regurgitation. Burning foods, overheated cooking oils and smoke from a fire can cause fatal inhalations. A bird with properly clipped wings may develop the "cute" habit of climbing down off of its cage to seek out favorite family members. A bird walking on the floor, especially a small one, may be easily injured by people who don't see it. Little Bad Boy, a green female budgerigar patient of mine, was one of the lucky ones; she survived being stepped on by her owner. She did suffer a broken pelvis and internal injuries that resulted in her requiring surgery. Another client with a beloved pet Quaker parakeet is still grieving over his death; her little bird was accidentally closed in a sliding glass door, and he died instantly. He was following his owner out the door when she slid the door shut behind her, not knowing that he was right behind her. I have dealt with the deaths of many birds that had been stepped on, closed in doors, vacuumed up and one even was squashed when it was playing under a bandana on a desk! The owner (a student) had come home and tossed her textbooks onto her desk, instantly killing her parrotlet. Birds have been squished by recliners and fold-out beds and have also been killed by owners sitting on them when they have crawled under cushions. Little birds have been killed by computer printers, after climbing into the cartridge area. Larger birds have been electrocuted by chewing through electric cords. One sun conure that was playing in a pile of clothing in the laundry basket was drowned when its owner dumped the clothes into the washing machine, closed the lid, and "washed" the bird with the dirty clothes. An Amazon parrot that is a patient of mine climbed into the open dryer and the unsuspecting owner closed the door and turned on the dryer. Fortunately, the dryer was only set on "fluff" and the bird was only briefly tumbled when the owner realized what had happened. If the heat had been on, the bird might have died or suffered serious injury. Birds have also hopped off owners' shoulders and into open refrigerators and freezers. Birds should never be left unsupervised outside of the cage, especially if other animals, including other birds, share the same house. Even if a pet dog or cat has acted completely trustworthy around a pet bird, it should not be trusted. Many birds have died as a result of another housepet either "playing" too exuberantly with a bird, or from the pet biting or stepping on the pet bird. 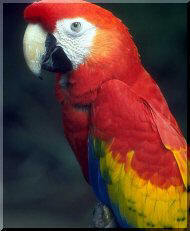 For example, a client of mine had recently purchased a young military macaw, Kelly. Their medium-sized dog had been introduced to the new baby, and it had reacted with interest, trying to lick and sniff the bird. They hadn't even owned Kelly for one week when, left unattended for just a moment to answer the phone, the dog bit through the bird's beak, causing severe bleeding and injury to the still soft beak. Luckily, Kelly survived the bite, and with time, the beak has regrown and now appears quite normal, but the owners spent many anguished hours, not to mention a lot of money, working with me to keep the beak tissue infection-free, as it healed. Birds may also injure each other. Lovebirds are notorious for nipping the toes of birds housed in neighboring cages. Toes are the most commonly injured body part, and bleeding may be serious, and even fatal. Especially with the onset of puberty, birds that previously got along together, may begin fighting, with fatal results. Any animal bite should be considered extremely serious, possibly life-threatening. The bacteria found in the saliva and the mouth of a mammal can cause fatal septicemia (infection in the bloodstream) of a bird in very short order. Cat bites should be considered the most dangerous, as the Pasteurella bacteria commonly found in the feline mouth, are extremely hazardous to birds. Even a simple puncture by a tooth can result in a fatal infection. Scratches from claws are also extremely dangerous, as the risk of infection is very real. There are several foods that are very toxic to birds. Chocolate is digested in a different way by birds, and the metabolite, theobromide, is very toxic to them. Baker's chocolate and dark chocolate are the most toxic, and milk chocolate, although less toxic, is still a forbidden food for birds. Caffeine is also metabolized differently in birds, which also results in toxic compounds. There is some data that indicates that some varieties of avocado are toxic to birds, with perhaps the skin and pit being the most dangerous parts. Although unlikely to kill a bird, to be on the safe side, avocado should not be fed to birds. Onions can cause a fatal hemolytic anemia in dogs and cats, but since birds' red blood cells have a nucleus, this may protect the cells from the severe injury that occurs in other species. However, until this topic is studied, it is best to not feed onions to birds. Some houseplants can be toxic, even fatal, to birds. Lists of potentially toxic plants have been published often in Bird Talk. Outdoor plants can also kill birds. I had a client with a pet cockatiel that died as a result of oleander toxicosis. Oleander is a beautiful flowering plant often used for landscaping in Florida where I live. Most Floridians can recognize this dangerous plant, however, newcomers to the Sunshine State may not know about it. This client, new to Florida, had placed some oleander branches in her cockatiel's cage, so that he could chew on the leaves and bark. When she next checked on her pet, he was already dead! It is very important that owners be able to identify dangerous plants that may be found in their bird's environment. There is no doubt in my mind that many a baby bird has expired as a result of hand-feeding mishaps. Unweaned baby birds should not be sold or given to inexperienced hand-feeders for this reason. It is not necessary for a baby bird to be hand-fed by the family purchasing it in order for it to become "bonded" to them. Budgies are routinely tamed down as pets once they have fledged by the parents, and this can also occur with larger birds fed-out by the parents. Baby birds can also be hand-fed by the aviculturist, and be visited by the new owners to allow the babies to become accustomed to their new families. Weaned birds can be sold to owners, and they will settle in with their new families in no time. So, there is no reason for a baby to be fed by an inexperienced owner. There are many different things that can go wrong during the hand-rearing process, including feeding formula improperly (mixed incorrectly, stored incorrectly, fed at wrong temperature), delivering the food improperly (dirty utensils, forcing food into the baby resulting in aspiration pneumonia, injuring the mouth or crop with feeding equipment), poor husbandry techniques (keeping the baby at the incorrect temperature, not practicing good hygiene, indiscriminate use of antibiotics), just to mention just a few potential problems. Most commonly, babies are kept at the incorrect temperature, or the food is fed at too low of a temperature, resulting in a slowed down gastrointestinal tract, which can be fatal, if not corrected in time. If the baby is forced to eat, it may struggle and end up inhaling the baby formula, resulting in aspiration pneumonia. If a large amount of food is inhaled, the baby will die immediately, but if a small amount of food ends up in the respiratory tract, the aspiration pneumonia may result in the baby suffering for days, trying desperately to breathe, before it dies. Infection is common in hand-feeding babies that are not cared for properly. Bacterial infection, fungal infection and polyoma virus infection are the most common infectious diseases in baby birds, and all can prove fatal. Hand-feeding is best left up to those with experience. Although it is fun to take baby birds to bird shows, swap meets and club meetings, it is very dangerous for the babies. Infections can spread to baby birds, even through the air, even if the owner is diligent about not allowing any direct contact with the babies. Many diseases can prove fatal to babies, especially polyoma virus. Adult birds are also at risk from exposure to other birds from the same sources, as well as from trips to the pet store, as well. Having parties where owners bring their birds can also spread disease. Unfortunately, a bird can carry a disease, and be able to pass it to others without appearing ill. Proventricular dilatation disease (PDD), chlamydiosis (psittacosis), Psittacine Beak and Feather Disease (PBFD) and pacheco's disease may all be spread by birds that MAY appear healthy in physical appearance. Giardia, a one-celled protozoal organism, can be spread by a bird ingesting food or water contaminated by the droppings of an infested bird. Remember that we don't even have tests for some of the diseases that birds can have! Deliberately exposing birds to other birds, even if they have been vet checked, is dangerous and should be avoided, or kept to an absolute minimum. Many bird owners make a common mistake when adding a new pet to the family. Regardless of the origin of the bird, and any testing run on the new bird, it should be quarantined for at least one month, preferably two, before it is introduced into the home. There is very sound logic for this. If the bird is harboring an infectious agent, the stress of moving the bird to a new home may precipitate it breaking with signs of clinical illness. Not every person can afford to test a new bird for everything we have diagnostic lab exams for, so quarantine can often protect the family's established pet birds from the risk of disease. And conversely, a pet bird may have a sub-clinical infection that it could pass to the new bird, so quarantine also protects the newly acquired bird. A client of mine had two pet birds, a cockatiel and a quaker. They bought a cherry-headed conure from a pet store, and noticed after about a month that it wasn't acting well. They had put the new bird in their bird room with their other two birds immediately upon bringing it home. The little conure tested positive for chlamydiosis, and because they did not quarantine the new bird, I ended up treating all three birds with injections (once a week) for almost two months. Follow-up testing showed that all three birds seemed over the infection. Then about four months later, they called me because the quaker wasn't acting well. When I inspected their bird room, there was a new green budgie in there! They told me that they had caught the budgie when it landed on the husband's shoulder outside their home. Instead of quarantining him, they once again put the new bird into the same room as their pets. I tested the budgie, and the tests showed that the budgie was shedding the chlamydial organism, as was the quaker! So, all the birds had to undergo treatment for chlamydiosis once again! Although none of the birds died, they had been quite ill. Testing and quarantining might have prevented this. Owners must understand that it is dangerous for pet birds to have direct contact with their owner's mouths. We carry bacteria and fungi that can cause serious infection, or even death, in our birds. Birds should never be kissed with an open mouth, nor should birds be allowed any contact with the owner's teeth, tongue, lips or saliva. Exotic birds, while from warm, tropical climates, cannot tolerate excessive heat. Children, dogs, cats, other pets and birds should never be left in a car during warmer weather, even with the windows partially lowered. Temperatures inside a car can rapidly reach lethal levels. Heat can also kill birds in a more insidious way. An owner may place a cage outdoors in the shade in the morning, for fresh air, and as the sun slides across the sky during the day, the bird may end up in the direct sun by the afternoon. With no place to escape the sun, a bird may rapidly develop hyperthermia and die. An overheated bird will begin panting, and with panting, will also begin getting dehydrated. Most birds suffering from hyperthermia will try to get out of the sun, and may try to bathe to cool off, if possible. If the bird's body temperature rises high enough, it will seizure and die. Hyperthermia can also occur if a bird's cage is relocated by a window, with no shade to escape the sun. Hyperthermia can also occur in baby birds, if a brooder is set at too high of a temperature, or if the brooder malfunctions. Birds should sleep in their cages. Birds that are allowed to sleep in bed with their owners are at serious risk for suffocation or life-threatening trauma. Even though an owner has slept with the pet bird for a while, there is always the chance that the bird will get lodged between the waterbed and frame, smothered under a pillow, or be rolled over on during sound sleep. It has happened all too often to allow such a risk. Although it is fun to read or watch television in bed or on the sofa with a pet bird, if there is a chance that you might doze off, it is time to return the bird to its cage.